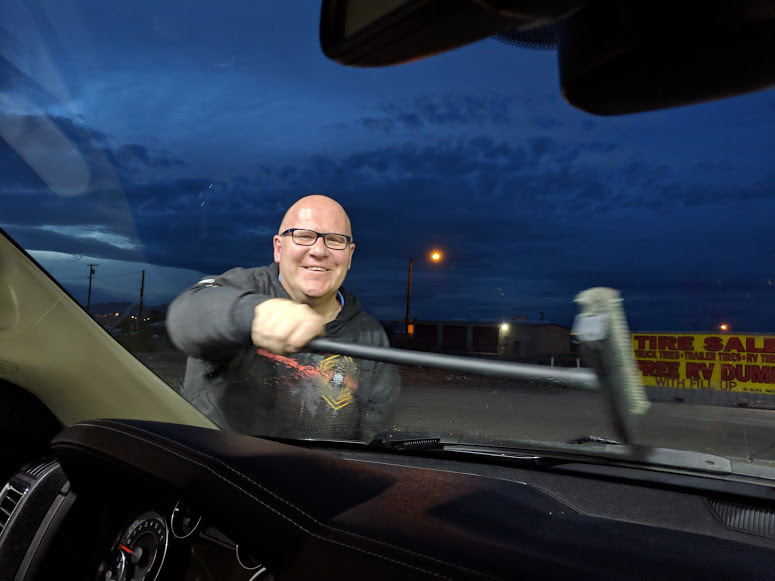 Arizona Road Trip 2019 - Big Bear Lake to Parker — Always Packed for Adventure! We have had a really cold, snowy, dreary winter, so in efforts to escape to somewhere warm, Dan and I hopped in our truck and went on a last-minute road trip to Arizona. I had been to Arizona, but I had not seen much of the state, including its capital, Phoenix. It was early March and Phoenix looked to have pool weather = mid-high 70’s, so it was the perfect place for our escape. I love road trips. Even when the unexpected happens ( like getting lost and driving a day out of our way in remote Utah), I’ve never had a bad time on a road trip. Road trips invite discovery and adventure. You get a real sense of a place, visiting towns that are not over-run with tourists. For example, on that Utah trip, we discovered an amazing restaurant in the middle of a field, where I ate the best cherry pie that I have ever tasted! I get a huge amount of joy from planning a vacation, but I like how on a road trip, we always find places that I never encountered during my planning. Road trips are by nature flexible and this aspect is exciting. We hit the road early on a Friday afternoon. 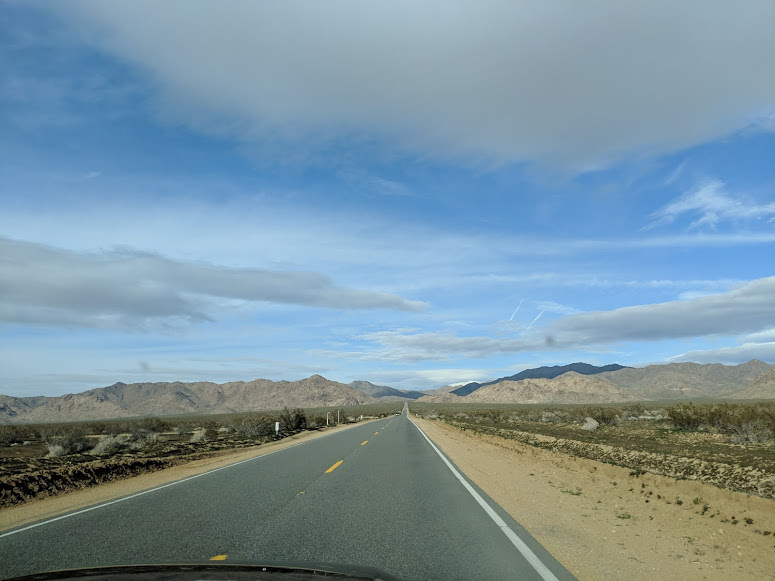 The first part of our drive was familiar, taking us off of Big Bear mountain and into the stunning desert landscape of the Lucern Valley. We’ve done this drive dozens of times: it’s our road to one of our favorite destinations, Las Vegas. However, for the first time, we were able turn off on the 40 East and head towards Needles! I never grow bored with desert landscapes. I love the soft palette of buttery sand and pale green cactus. The blue sky was filled with clouds. We took tons of pictures until we lost the light. We got excited when we spotted a helicopter on a trailer! Here’s a shot of Dan behind the wheel! A big thank you to Dan for doing nearly all of the driving. I took over for a little bit on the way home, but Dan did about 90% of the driving on our four-day trip. We drove for over twenty hours! As the sun was setting, the landscape was changing. The hills were turning more jagged and the colors was becoming tangerine and rust. We both wished that we had been able to start our drive earlier in the day, as we were missing the stunning Arizona scenery. A road trip is all about the views and driving at night spoils it. The last few hours of the day were driven in the dark. We battled bugs on our trip! Well, actually they died on our windshield and we battled the heavy accumulation of bug guts! On the first night, we stayed at a Hampton Inn in Parker, Arizona. I have to confess that the hotel was not in the best area. The Hampton Inn was lovely and consistent with the brand. I’m a fan of Hampton Inn, I always find them to be a decent and reliable place to stay. The guy at check-in gave us a huge bag of snacks and extra water, so that was a bonus. Unfortunately, the hotel’s location was in a very industrial area with several unsavory looking people lurking nearby. I would not have felt safe outside of the hotel, if I had been alone. We walked to a nearby Mexican restaurant called Maya’s Restaurant. Immediately, I liked Maya’s Restaurant because of the warm welcome that we received from the staff. Although it was a Friday night, the place was dead and we were among a handful of customers. The decor was festive, even if the vibe was quiet. It looked to me that it had originally been a 1950’s diner that had been changed to a Mexican restaurant. We kicked off our mini-vacation with a large banana margarita for me and a Corona for Dan. We feasted on the combination (shrimp, steak, chicken) fajita platter. My mouth is watering just remembering our meal! In a store window next to Maya’s Restaurant, I spotted this picture. It made me laugh, but I also took it as a reminder to keep from getting speeding tickets on this trip. I’m happy to report that this was a ticket-free holiday! We were back in our hotel room before nine and asleep, getting rest for all of the fun that we were about to have on Saturday!